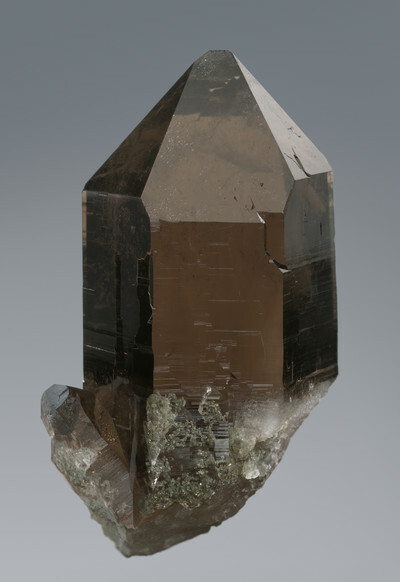 A normal habit smoky quartz as it is commonly found in the southern Aar Massive of central Switzerland. The crystal has a macromosaic structure (resulting in the typical superficial sutures on the crystal faces) that is seen in almost all quartz crystals from the Aar and Gotthardt Massives. At the base of the crystal there are small vermicular inclusions of chlorite. From the Feldschijen mountain, Turm I (first tower of Feldschijen mountain), Göschenen, Uri, Switzerland. Found by Paul von Känel, Collection Bill Morgenstern. Height of the crystal: 63 mm.